Reoperation for hyperparathyroidism represents a surgical challenge. The opportunity for therapeutic success is reduced while the potential for morbidity is increased when compared with initial exploration. 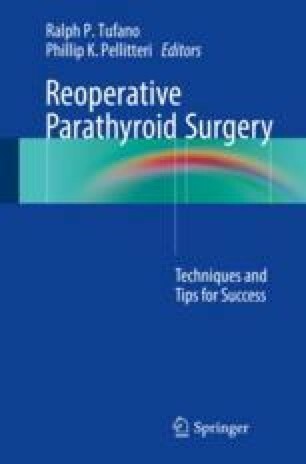 The utilization of correlative localization studies together with intraoperative determination of parathyroid hormone (PTH) levels provides benefit to the surgeon in limiting morbidity while optimizing outcomes. When evaluating patients with recalcitrant hyperparathyroidism, a regimented, methodologic management protocol should be followed to maximize the potential for successful outcomes. This chapter presents an algorithm for surgical management of patients with this disorder.